Fiddes Clear Glaze Varnish - Goosebay Sawmill and Lumber, Inc.
What is glaze? The English use the word “glaze” when we say varnish. What makes Fiddes Clear Glaze varnish different than other varnishes? It is very difficult to find a varnish brand today that does not employ urethane resin. Fiddes relies on an older type of formula that has a very natural appearance and, most importantly, no urethanes. The strong advantage of using Clear Glaze is that it can be recoated at any time with good adhesion between coats. This means that future coats can be applied without having to strip to bare wood. Most urethane-based varnishes, whether solvent based, or water based, have poor coat-to-coat adhesion, especially when the finish has dried for a long period of time. Clear Glaze is extremely durable in both scratch and spill resistance, making it suitable for floors, cabinetry and fine furniture. Clear Glaze has excelled self-leveling quality and a moderately fast dry time, making its application comparable to a quality brushing lacquer. Application: Primarily by brush but thinned Glaze can be applied by rag with good results and spray application can be used by shops which are set up with quality spray equipment. Thinning: Fiddes White Spirit. This is a high-grade mineral spirit that promotes good flow of the Glaze varnish. Clear Glaze is often used unthinned when applied by brush or spray, but some may find that 10% to 15% thinning will promote good material flow. Experimentation is necessary when Clear Glaze is applied by rag, but 30% to 40% added White spirit is usually suitable. Thinning beyond these percentages is not recommended as the Glaze may become too saturated. 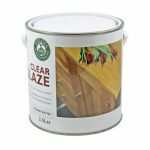 Clear Glaze Matt- Use when the lowest sheen is required. The matting agent can cause streaking when applied by brush or rag, so it is best to use only one or two coats. Spray application avoids the problem of streaking. Clear Glaze Matt is an excellent sanding sealer. One coat left to dry 12 to 24 hours will sand to a powdery smoothness, making a good foundation for top coats of Satin or Gloss. Clear Glaze Satin- A medium sheen that can be rubbed down to a slightly lower gloss or buffed up to a slightly higher gloss. Used in two or three coats by itself or very effectively over a first coat of Matt Glaze (used as a sanding sealer). Clear Glaze Gloss- A very clear coating with just a slight warm amber characteristic. Used in two or three coats by itself or over a first coat of Matt Glaze (used as a sanding sealer).